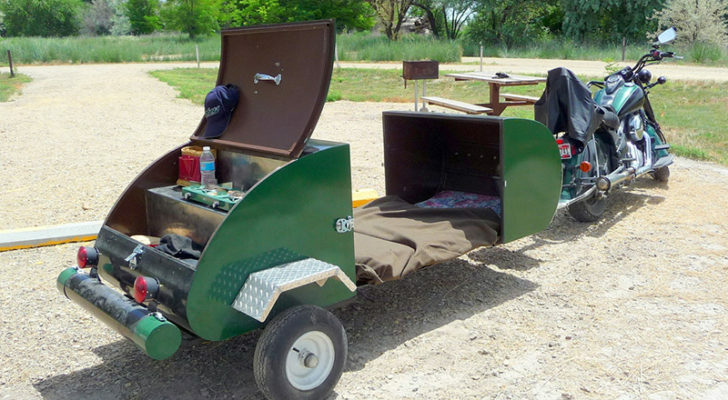 So You Like RVs - Why Not Buy An RV Park? 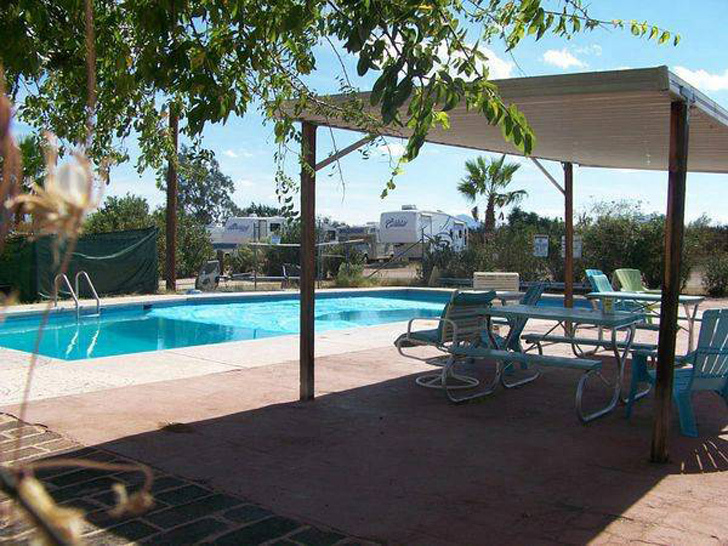 For less than two million dollars, you could own this popular Arizona RV park. Get your checkbook out! 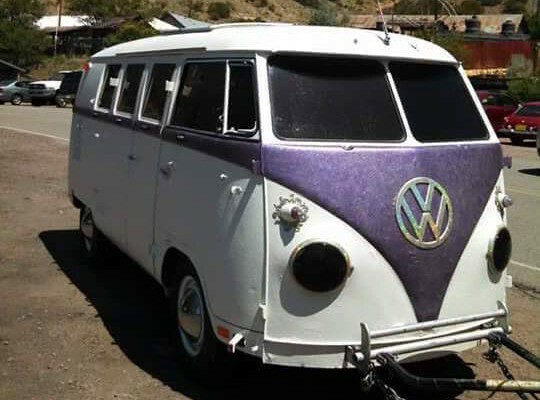 It’s a pretty safe bet you’re an RV aficionado, but have you ever considered jumping in with both feet? 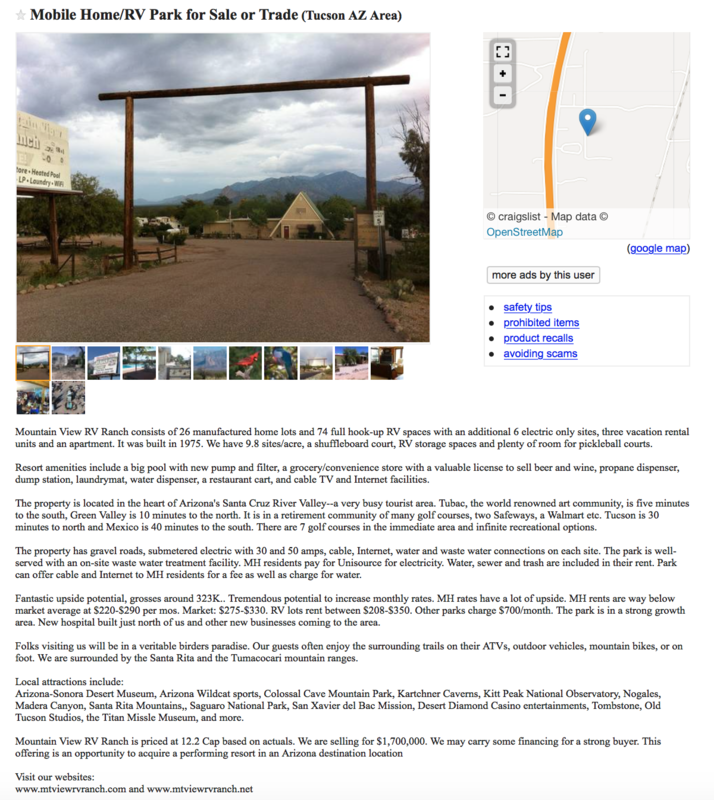 Here’s what I mean: craigslist, the place to find everything – and I mean everything – has an RV park listed for sale. I have to say, the place looks pretty cool. So, what does $1.7 million buy in the RV resort market? 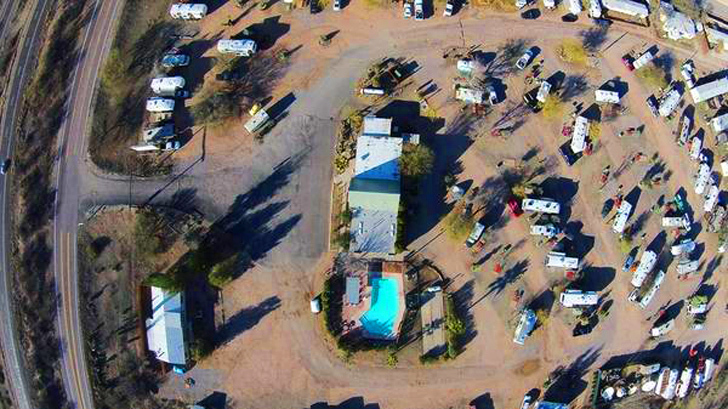 The RV ranch as seen from overhead. 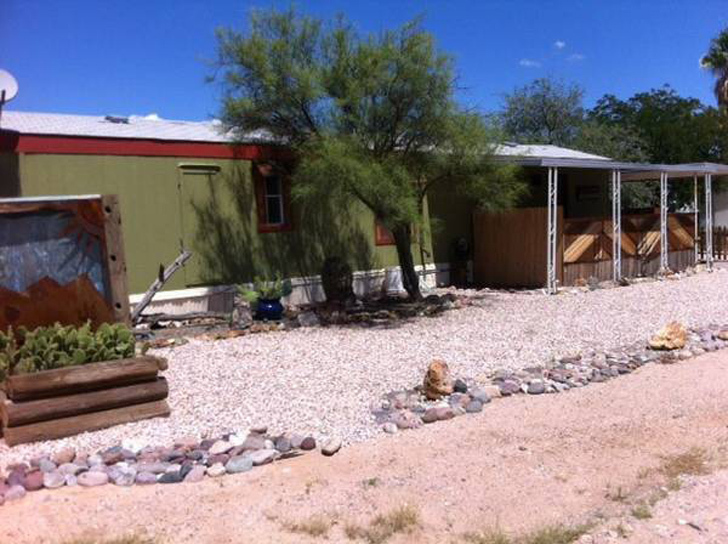 The place is called the Mountain View RV Ranch and it’s located near Tucson, Arizona. 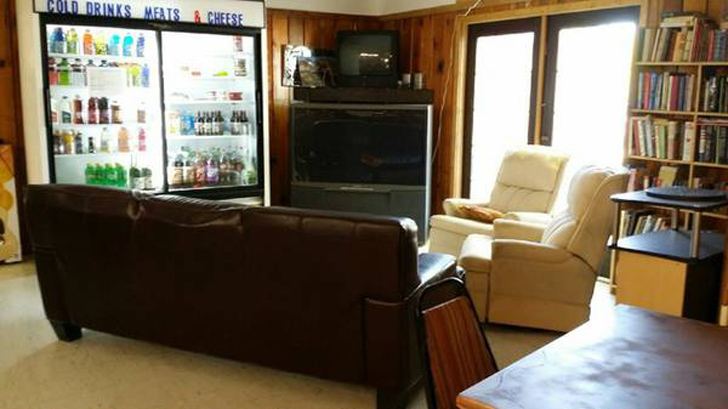 The property comes complete with 26 mobile home sites, 74 full hookups for RVs, six electric only sites, three vacation rental units and an apartment. 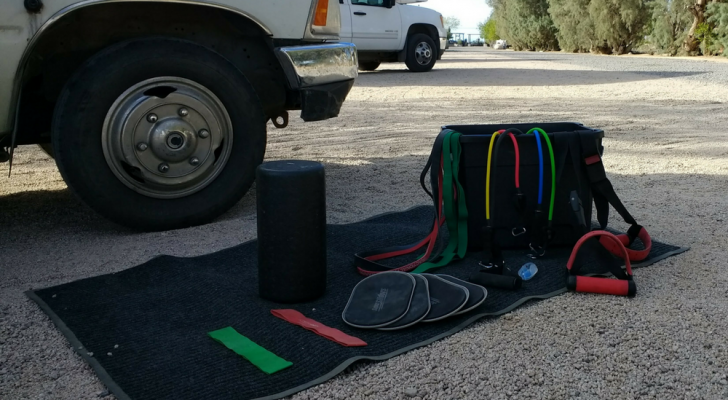 It all comes wrapped with gorgeous desert mountain views and all the goodies. A view over the RV lots to nearby mountains. 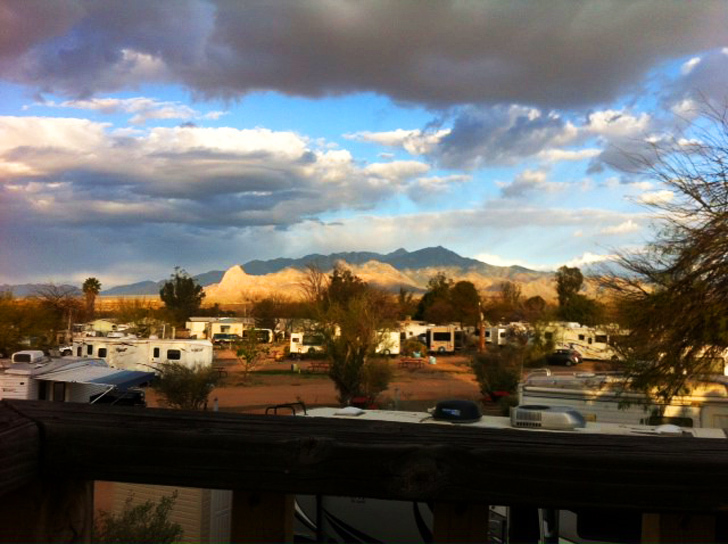 So, what makes the RV ranch a great place for RVers to stay? I mean, if you are going to invest, you need to know what kind of business you can expect, right? First, the park is pretty spread out at only 9.8 sites per acre. There is a nice in-ground pool that has recently had the pump and filter replaced. 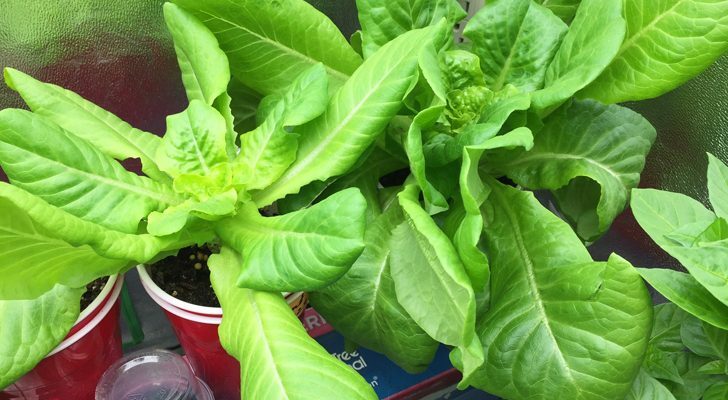 There’s also a full service convenience store that is licensed for liquor and beer, a propane dispenser for refilling tanks, a dump station, an on-site laundromat, water dispensing for fresh water tanks, a restaurant cart and cable and Internet access. 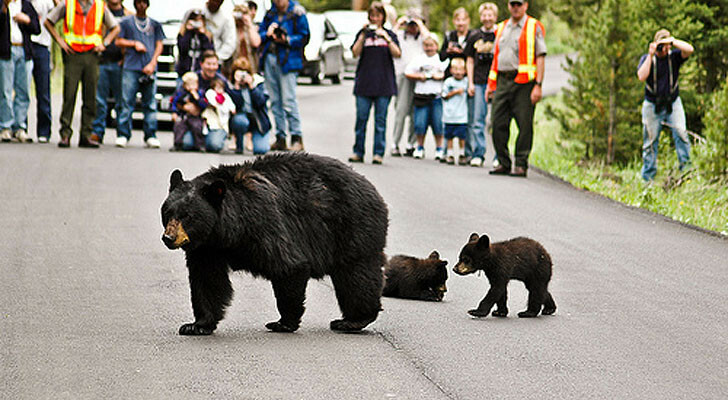 The area is popular with bird watchers for shots like this. 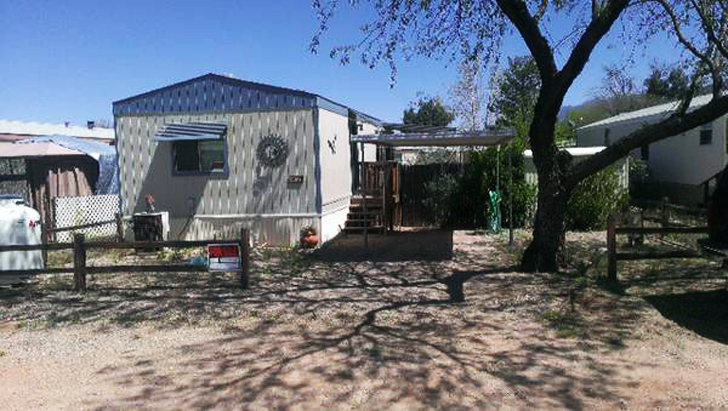 The Mountain View RV Ranch sits in a retirement community that’s less than an hour from the Mexico border, and just thirty minutes from Tucson. Plus you’re within a five minute drive from a world famous artist’s colony. Each site is sub metered with 30 and 50 amp electric, water and Internet. 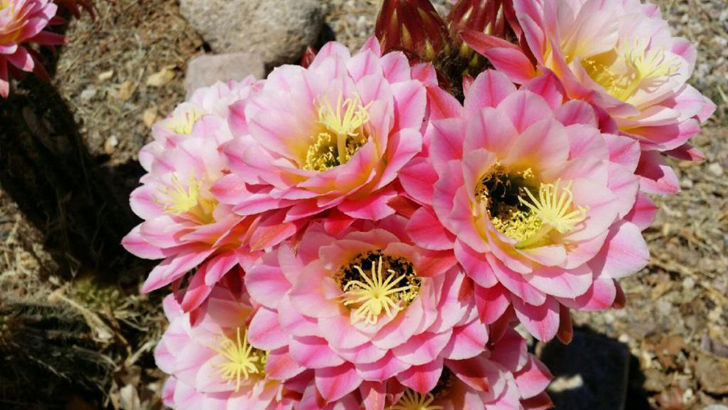 Cactus blossoms lending color to the desert. It’s a money making business that grosses over $300,000.00 annually and seems to have a lot of room for improving revenue. All in all, a nice little home that has a built in business. 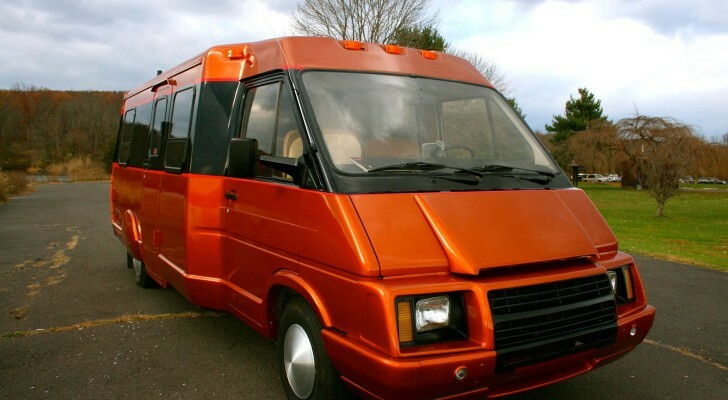 If RVs are your thing, it might be for you. 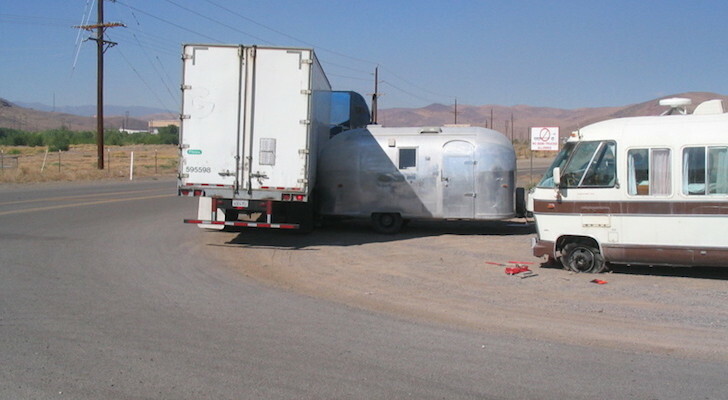 However, I wonder how many full-time RVers are really interested in being tied down to that kind of responsibility? 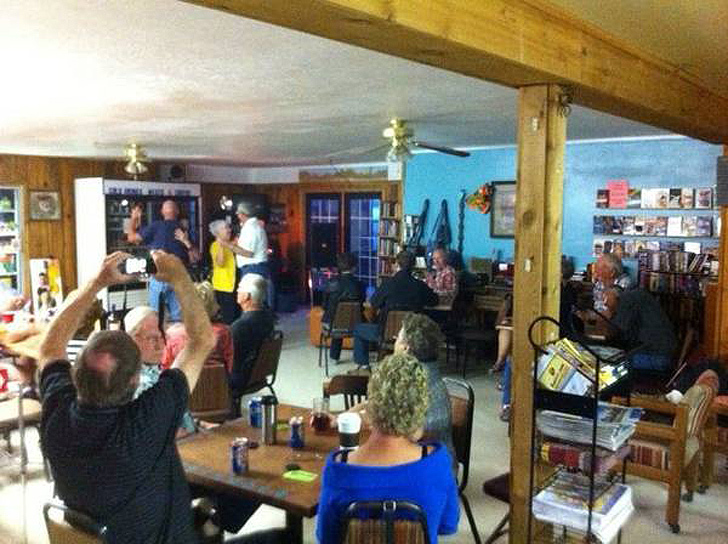 Guests enjoy concerts and community areas in the clubhouse. 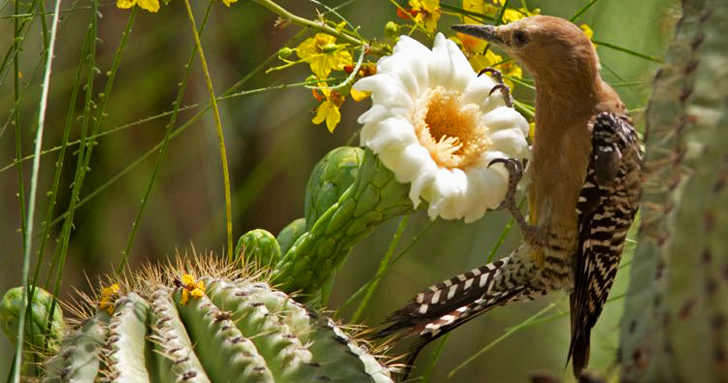 The park is a birder’s paradise and if you had responsible help, there are plenty of attractions to visit in the nearby area during your down time. But, having run several businesses myself, I know how infrequently that comes along for owners. As with so many things in life, for a person that could discipline themselves to occasionally step away from work for a bit, it could be a fun and rewarding experience. A must in the Arizona desert: a large, in-ground pool. Views of the manufactured housing in the park. The risk is that turning your passion into your occupation has a way of stealing some of the joy. So, for me, it would likely be more work and less play, but it’s tempting. Listen to me, talking like I just have $2 million to toss into a mobile home park investment! See the original ad or an archived copy if the link doesn’t work.